At this point you should have already chosen a green building program, completed the corresponding checklist, and registered your project. 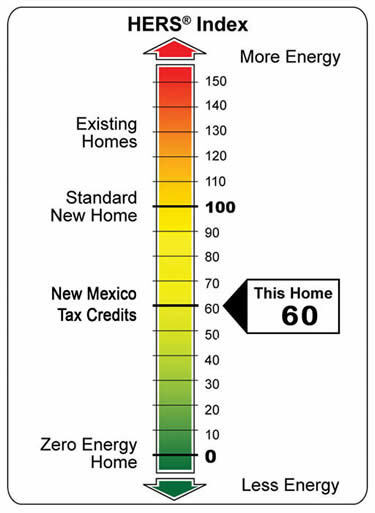 It is also important to understand HERS Index requirements for tax credits or green building program levels. Make sure the credits on the checklist you've chosen to achieve are included in your takeoff and bid packages. Go Green, NM suggests you observe the Manual J, D, S requirements. Ask your mechanical contractor! This is difficult particularly when targeting a HERS Index unless you know where you are on the scale. We can help you realize a projected HERS Index from plans before you begin construction. A projected rating from Go Green, NM will help you and your mechanical contractor specify the mechanical equipment. Alternatively, if you are interested in green building and need our design, tax credit, or product identification support we can help! If you need support evaluating a program we can help! Click here to view our Plan Analysis page for details or return to Our Process to view how we can help you pre-construction plan for your next project and meet all these requirements!